whenever i think of creme brulee, i think of my friend, kent chao. while we were in college, kent used to work at noodle-ism. one night, he got bored and started making a lot of creme brulee at his apartment. then, before we knew it, he was making lots and lots of it to sell at noodle-ism. 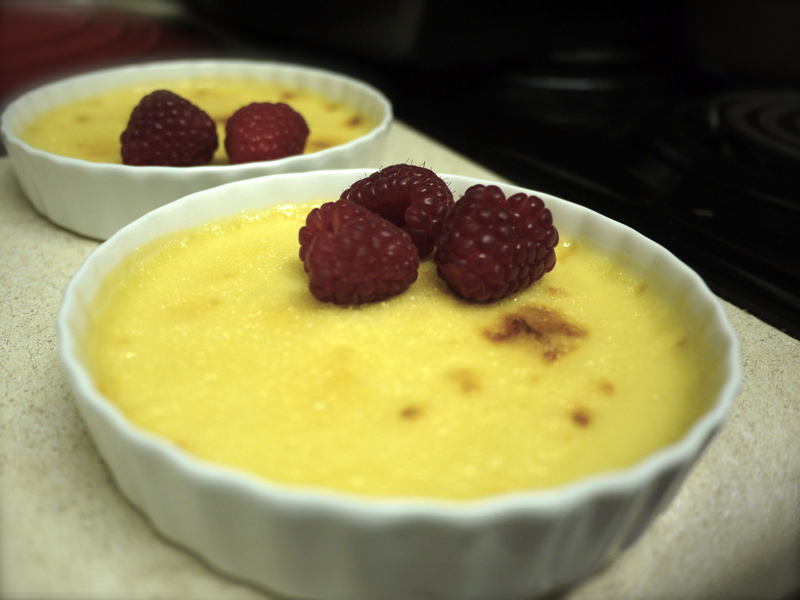 creme brulee is my friend stephen’s favorite dessert, so i decided to make some for his birthday. it turned out okkkkk, but my favorite version is still the kent-chao version…with amaretto liqueur. you guys know i like my amaretto sours. Bring a large pot of water to a boil. While you are waiting for the water to boil, combine the cream, 1/4 cup of sugar in a saucepan over medium heat. Stir until steam begins to rise. In a separate bowl, beat the egg yolks and vanilla. Then slowly pour the hot cream and sugar mixture into the yolks, stirring constantly so that the eggs don’t cook. Pour mixture into ramekin cups (I was able to pour into 5 cups). Place the ramekins in a baking dish and pour the boiling water into the dish until the water is halfway up the sides of the ramekins. Bake for 25-30 minutes @ 300 degrees. Chill ramekins in fridge for 6 hours. Before serving, sprinkle 1 tablespoon of sugar over each custard. Use a kitchen torch or stick in oven under the broiler (move the rack to top shelf) for 2 minutes until crisp and brown.